Patients diagnosed with bulging, herniated and degenerative discs as well as spinal and foraminal stenosis ( pinched nerve) may get relief from non-surgical Spinal Decompression Therapy. Dr. Karas has been using traction in his office for over 30 years. 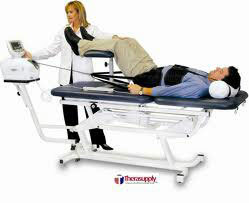 The older spinal traction tables applied a designated pull force to the spine but did it too abruptly. This caused some patients muscles to tense up. A natural reaction of the bodies stretch reflex guarding mechanism to protect the spine. The new Spinal Decompression Therapy traction tables are computerized. This allows for a more gentle, gradual traction , reducing the guarding reflex. The more relaxed you are the better the stretch to the spine and discs. Patients must be evaluated to see if they are candidates to receive this form of treatment. A comprehensive consultation and examination is performed. All previous and current diagnostic tests are then reviewed. Treatment will often begin with muscle stim. and hot packs to relax the patient. They are then positioned on the treatment table for their neck or low back traction. Treatment phase: The computer will slowly and gently pull and release, pull and release promoting fluid exchange and reduced pressure on the joints and discs of your spine, about 6-12 minutes. Cool down phase: The computer gently releases the traction back down to zero, 1-2 minutes. The patient is guided on the proper stretching and strengthening exercises as well as lifting, sitting and sleeping ergonomics to help their recovery and try to prevent relapses. The treatment is covered by most insurance companies. Payment plans are available for non insured patients. It will not cost you thousands of dollars of out of pocket expense charged by some other facilities. Our goal is to reduce the need for drugs and surgery. Call for a consultation to see if you are a candidate for Spinal Decompression Therapy.